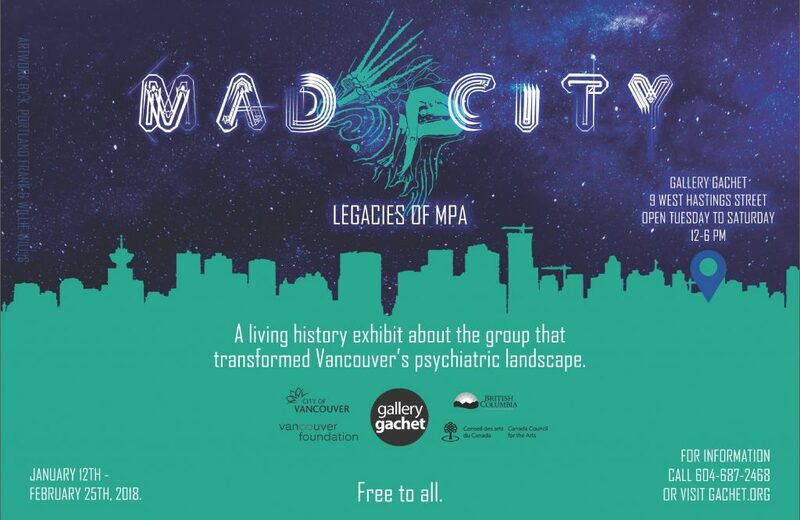 MAD CITY: Legacies of MPA, a historical exhibit at Vancouver’s Gallery Gachet, is based on a radical idea: that people with a psychiatric diagnosis should create and run the support services they need. Using the lens of the past, MAD CITY invites visitors to imagine a mental health system conceived and directed by “experiential experts”: people with first-hand knowledge of the system, with a passionate commitment to the field, and whose self-worth is enhanced because they are building a better future for their community. The MPA (Mental Patients Association) was founded in 1971 as a grassroots response to deinstitutionalization and tragic gaps in community mental health. The group put former patients and lay allies in charge of its many successful social, housing, and employment projects, and in the process challenged the power of psychiatry. 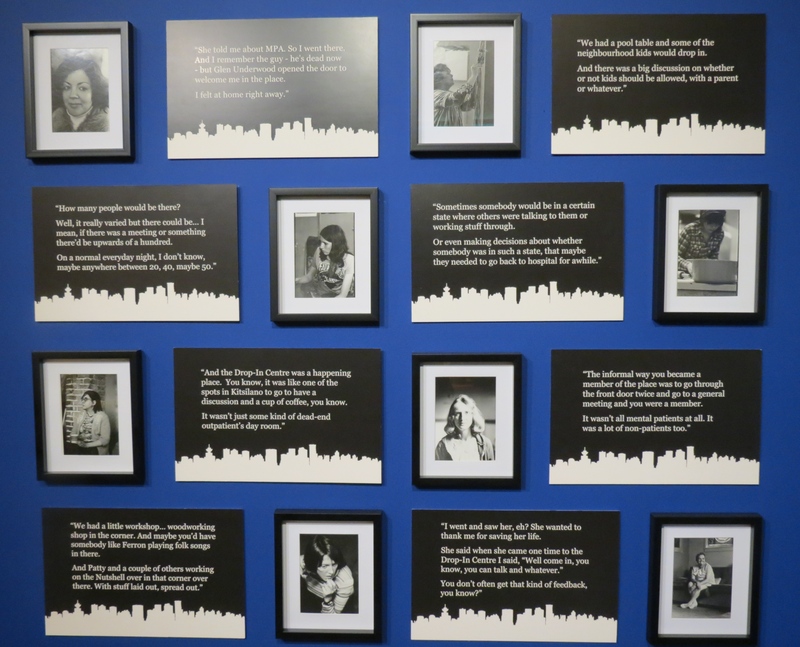 In MAD CITY, visitors can explore a multi-media display of MPA’s initial contributions to mental health in Vancouver, view 30 black and white portraits of early MPA members, and time-travel back to the iconic 1970s MPA Drop-In, recreated in the heart of the exhibit. MAD CITY is not intended to be a staid walk through history. 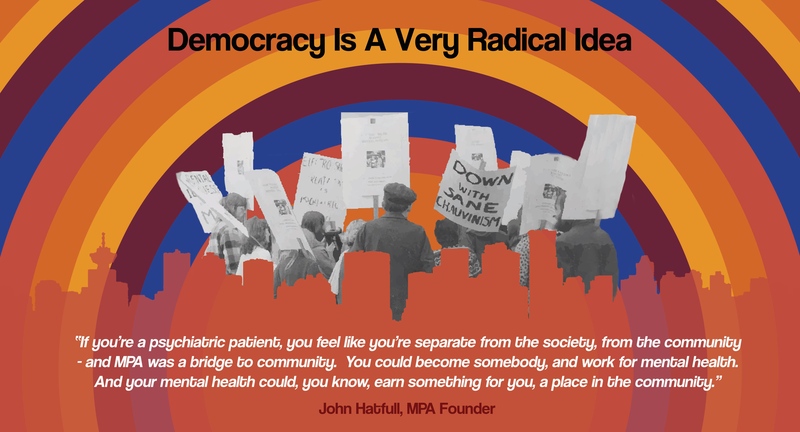 Democracy is a Very Radical Idea, the exhibit’s most standard display of the past and the one first encountered by visitors as they enter the gallery, challenges easy understandings of radicalism by considering how MPA worked simultaneously alongside and in opposition to mainstream mental health. The group’s radical policy of voting on paid positions provided tremendous empowerment to marginalized former patients, allowing members to take on new and important roles in the emerging system as ex-patient, community-member, advocate and community mental health worker. MPA’s Kitsilano Drop-In, the group’s epicentre and a place of emotions, creativity, political action and community, is represented by a re-imagined installation of the space, circa 1976, where visitors are invited to grab a cup of coffee, sit down, and read an original copy of In a Nutshell, MPA’s attention-grabbing tabloid newspaper. Everything in the installation can be accessed in a tactile fashion, a value endorsed by the Smithsonian’s latest accessibility guidelines. Indeed, the MPA Founder who lent Nutshells to the exhibit agreed that if an eager reader absconded with a copy, we would actually be pleased. “Equality, democracy, and social justice were bywords of the period, and at MPA we tried to give life to both the words and the ideas they represented, scripting them into the everyday life and activities of the group,” MPA Founder Lanny Beckman told me in 2011. As the team member responsible for recreating the Drop-In, I used footage from the 1977 NFB documentary about MPA as a blueprint, scoured Value Village, the Hornby Island Free Store, craigslist and friends’ basements for furnishings, convinced my brother to build five oversize window frames, and located a scene painter to recreate the street view outside the Drop-In. These were new tasks for me as a social historian, but the reward was instant recognition from early members as they entered the space. But visual cues to the critical linkages between politics and praxis described by Beckman work on another, more subtle level, in this living history installation. On the wall across from the installation are recollections of the Drop-In shared by MPA Founders. Set alongside these memories is a series of 30 evocative black and white portraits of MPA members, shot at the Drop-In in 1975 and discovered in a Founder’s bedroom closet six years ago. The MPA members in these framed photographs, the artist who took the pictures, and the voices who tell stories of the Drop-In have been rendered anonymous for this exhibit, reflecting the way in which many mad people vanish from public memory as people with complex lives, abiding passions and worth. In this fashion, these powerful portraits stand in place not just for 30 individuals, but also for the thousands of people who walked through the doors of the MPA Drop-In over the decade that it remained at its Kitsilano location. 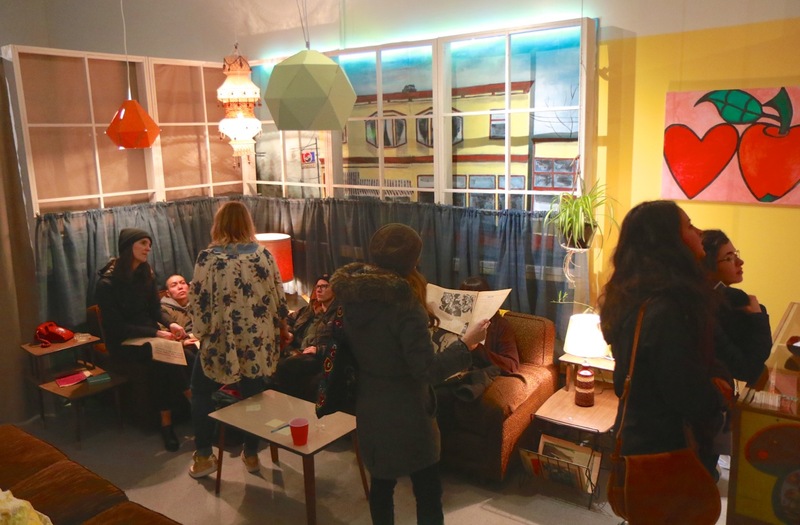 Gallery Gachet is a social justice arts space for marginalized members of Vancouver’s Downtown Eastside. But Anthony Meza-Wilson, Gachet’s Volunteer Coordinator, sees MAD CITY as an exciting opportunity for cross-fertilization between communities. Indeed, beyond the historical grounding provided by Mary-Ellen Kelm (SFU), Megan Davies (York) and Geertje Boschma (UBC), crafting this kind of historical exhibit has necessarily involved expertise from across many spheres. Community consultation with people who experienced MPA and its legacies pushed the organizers to let people interested in re-forming mental health know about MAD CITY and provided key exhibit themes to guide MAD CITY’s planning and execution: passion (for social change work, collective voice, empowerment); worth (personhood, being listened to, meaningful work); community (inclusion, democratic participation, commonalities, peer support). Marina Morrow (York), a community psychologist with a commitment to using history as a catalyst for dialogue about future policy and practice, worked with educator Susan Heximer (George Brown College) to bring together nearly 30 practitioners, policy makers, activists, funders and educators at MAD CITY for a discussion of how MPA’s story informs current and future mental health policy and practice. Local project coordinator Cindy Jiang told me, “As a person with concurrent disabilities who benefitted from advocacy work in the 1970s, this exhibit reaffirmed that anyone can reach their goals with appropriate support.” In addition to Jiang’s familiarity with Vancouver’s mental health community, her skills in theatrical set creation proved essential. Graphic artist Willie Willis’ design elements locate visitors in the 1970s and Vancouver, integrating pieces of MPA’s vast visual, written and audio archive that illuminate exhibit themes. Having MPA Founders Patty Gazzola and Arthur Giovinazzo join SFU graduate student Candice Klein as exhibit hosts means that visitors can connect directly with individuals who hold the history of the early MPA. For Gazzola and Giovinazzo, this has been a time to reacquaint themselves with former MPA colleagues and friends (in person and through the exhibits) and to take pride in their work of more than 40 years ago. As Arthur Giovinazzo told me, he spent the 1970s working to secure MPA funding and keep its programs afloat, not thinking about MPA’s place in history. The story of the early MPA continues to matter to those who wish for a more compassionate and helpful mental health system. MAD CITY is intended to convey the profound humanity of the group, and the potent way in which it reordered power relations in mental health. 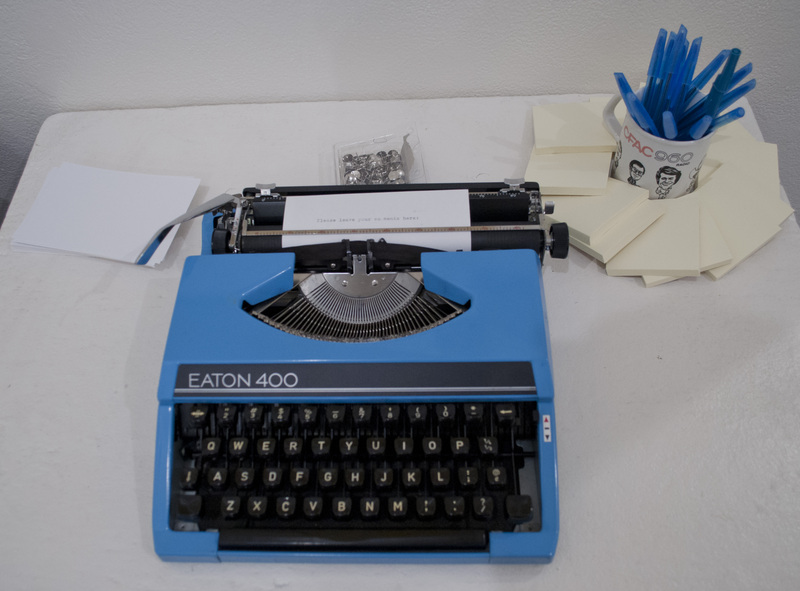 We plan to use visitor responses to the exhibit, expressed via our vintage typewriter or Polaroid camera, to evaluate the broad health impacts of advocacy exhibits like MAD CITY. MPA left behind its radical roots and became an important service provider, but the story of its early years endures – in memory and in legend. Speaking at MAD CITY’s opening, MPA Founder John Hatfull recalled his days with the organization as, “Really the high point of my life.” An audio of the event registers a sympathetic sigh of audience acknowledgement for a lost utopia. Megan Davies is a BC health historian who researches old age, alternative medicine, rural health and madness (historyofmadness.ca). She is executive producer of the documentary The Inmates Are Running the Asylum: Stories from MPA. Megan teaches at York University.